Mazel Tov! 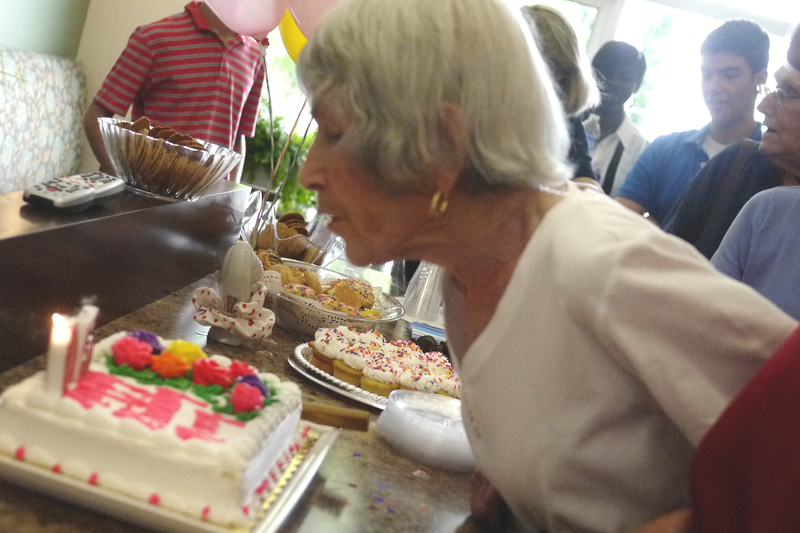 Mary Shofer blows out the candles on her cake. Through physical labor (working our land) and recreational activities (hiking, walking, kayaking and Tai Chi) I am committed to improving my stamina and physical health. But now that I am back in my home town for the next 30 days following the death of my brother-in-law, so that my husband can say kaddish with a minyan, I had to figure out a way to stay physically active. Other than obligatory dog-walking, the high heat and humidity of my home town in summer makes outdoor activities unbearable. So I decided to join the gym closest to my house, which happens to be a senior fitness center. Although I am one of its youngest members, this is not a gym for wimps. 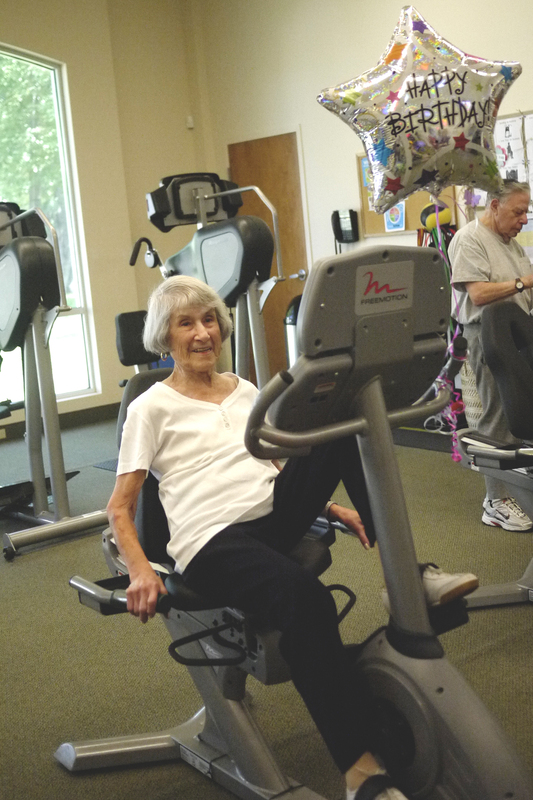 There are plenty of seniors in their eighties and nineties using not only bikes and treadmills, but also the weightlifting equipment. But no one is the equal of Mary Shofer. “Are you coming to Mary’s surprise birthday party this Friday?” one of the trainers asked me. Mary is a regular at the gym. She comes five days a week, starting with the recumbent bike, where she pedals for 45 minutes without a break at a vigorous clip. From there she does the entire strength-training circuit, using all the weight machines. What makes it unique is that Mary is about to celebrate her 105th birthday. Yes, you read that correctly. Mary is one hundred five years old! Mary worked full-time until she was 98. She does not even wear glasses. She walks unaided. Her face is mostly unlined; her hair is thick and cut in the latest style. 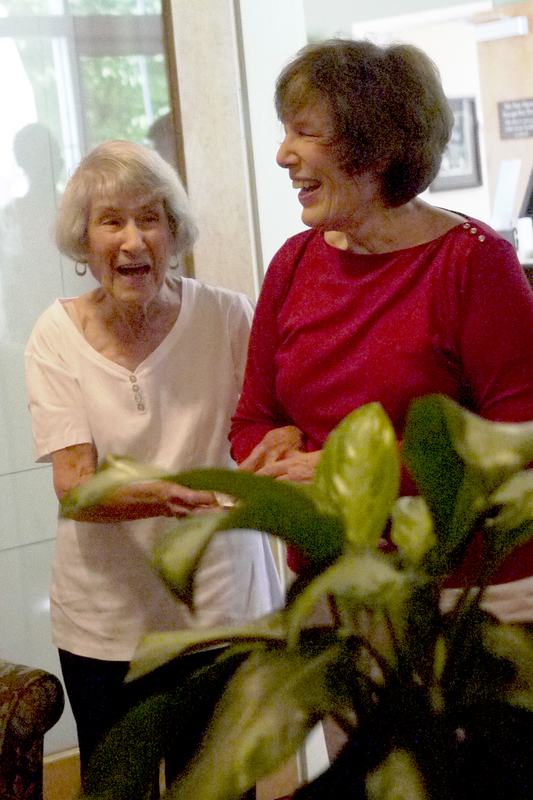 She does have an aide who drives her around town, but at night she lives independently. Usually after her visit to the gym, she goes home for lunch and a short rest, and then she goes for a walk. But not on Fridays. “After the gym, I have to get ready for Shabbos!” She does all her own cooking and is happy to discuss her menu: gefilte fish, chicken soup, brisket and kugel. She then shares several of her recipes. While she has clearly won the gene pool lottery (her sister is 99 and also going strong), there is one thing you notice immediately about Mary: she radiates simcha (joy). Her cornflower blue eyes sparkle; she is always smiling and her laugh is infectious. Somehow when you talk to Mary at the gym, you stand a little straighter, exercise a little harder, kvetch a lot less, and soon, you are laughing, smiling, and feeling a whole lot happier, too. 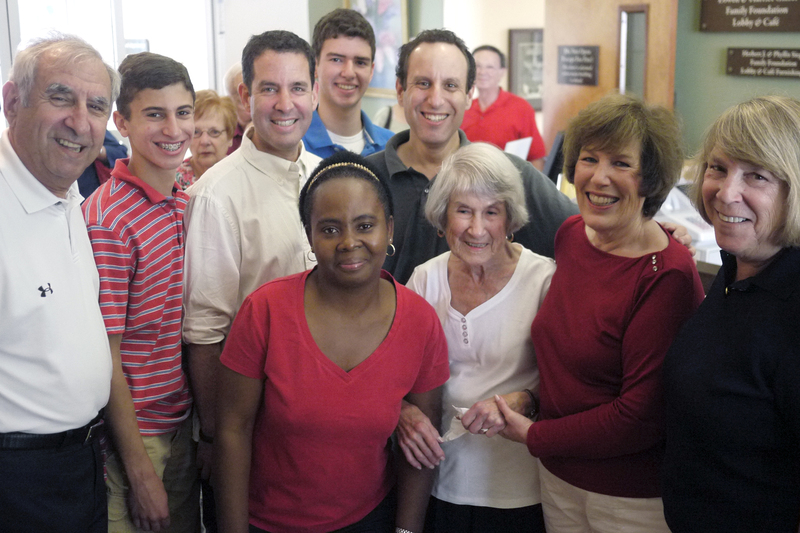 Surrounded by senior groupies in their eighties who were nonetheless 20 years her junior, Mary was completely surprised by her many well-wishers, including her daughter, grandchildren, and great-grandchildren . A Jewish blessing commonly given on someone’s birthday is, “May you live until 120.” According to Deuteronomy 34:7, Moses lived until that age, and “his eye had not dimmed, and his vigor had not diminished.” G-d willing, Mary Shofer is, bli ayin hara, well on her way to fulfilling that blessing, while enriching the lives of those around her. Mazel Tov! Minutes before the holiday of Shavuos, we were informed that my husband’s youngest brother had just been diagnosed with Stage IV lung cancer. It had spread to his bones, liver, and brain; the prognosis was about 4 – 6 months without intervention. The family (my husband and his other brother) decided to treat him palliatively; aggressive treatment wasn’t really an option. We thought about when my husband would fly out to California to visit him. But on Monday, June 3 – – just 3 weeks after his initial cancer diagnosis – – we got a call that he had died in his sleep. And so, rather abruptly, we’ve temporarily left our home in Maine for our home town, for the thirty-day mourning period for a sibling, known as shloshim, so my husband can say kaddish (the Jewish prayer for the dead) in a daily minyan (prayer quorum). How do you sit shiva for someone you didn’t really know? My husband’s youngest brother was nine years younger. My husband had left home at the age of 18 and lived in a different state, and then a different country, so he really didn’t have much contact with his youngest sibling. My brother-in-law had lived in a board-and-care home for more than 30 years, the result of devastating mental illness that left him a shell of the person he used to be. My husband called his brother on the phone, but the connection was usually poor and his brother was not really interested in talking. My brother-in-law didn’t really enjoy visits, either. He was always in his own strange delusional world before cancer struck, and it had been no different these past 3 weeks . My brother-in-law’s schizophrenia was especially devastating because of the person he used to be. At the age of 5 or 6, his father taught him to play chess, and that became his passion. He wasn’t just good – he was a chess genius, a young Bobby Fischer-in-training. He played in tournaments all over the place, and by the age of 14 he was the US Western Division chess champion. He became a chess Master and by the age of 18 his only game losses were to Grand Masters. He was just shy of reaching the Grand Master designation (based on points accumulated through tournament games via the US Chess Federation) when mental illness reared its ugly head. Tragically, at age 20 he stopped playing chess forever. On meds, he was a zombie and couldn’t play; without meds, he heard voices that confused and distressed him, and got him into all sorts of troubles. He could no longer care for himself. Three things were constantly happening to all his possessions – – from stuff, to clothes, to bed linens, to personal hygiene items: either they were stolen, lost, or he gave them away. Once, my mother-in-law was horrified to find him laying in a bedsheet so dirty it was black; in the winter he was shivering with cold because he didn’t have a coat. He only had one pair of underwear. She hurried to replace everything anew, with several duplicates to spare, at great expense with money she didn’t have. But within a day or two they’d once again be gone, and once again my brother-in-law couldn’t really say what had happened to them. He just couldn’t keep track of his possessions. Nor did he seem upset or distressed by their lack. He always just said, “It’s okay.” He also couldn’t drive, though in the initial phases of his illness, before he was admitted to the board-and-care home, he still did. Years ago, he got ticket after ticket, but paying them wasn’t something he could do, not because he didn’t want to, but because they just weren’t part of his reality. So one day when he got yet another ticket, the police saw that he had a warrant out for his arrest due to all the unpaid tickets, and he ended up in L.A. County jail. It was only when a missing persons report was filed that we even knew he was in jail. He simply couldn’t remember a single phone number of someone to contact to let them know what had happened, so he sat in jail – – this poor, sick young man – – amidst murderers, gang-bangers and rapists – – until we found out about it and could get him out. His niece responded, reporting that he had died only one day after the post-er’s query. Word spread quickly via the Internet, and the accolades began pouring in. It was such a nechama (comfort) to us, that his legacy lived on. Imagine: it had been thirty-six years, and even without playing a single game since then, he was currently ranked #414 out of the entire USA! Needless to say, when we found out the news of his death, we high-tailed it back to our home town. I drove my husband to the Portland ME airport so he could be back in our home town by that same evening; I continued driving with the car the many miles so I could be there the next day, in time for the funeral. We flew my brother-in-law’s body to our home town, so that he could be buried with most family members present and with a minyan. My husband’s other brother spoke emotionally at the graveside funeral, and he really did honor his memory. Because despite his tragic life, my brother-in-law was not a bitter person. He was a gentle man. He never had a sour word for anyone. He was truly a nice person. If someone did something to him that wasn’t nice or even downright cruel, he just let it go and said, “It’s okay.” And he meant it. Many of you are probably thinking that I am guilty of lashon hora – – speaking negatively of the dead – – by speaking about my brother-in-law’s diminished, very ill self. But I believe mental illness is a very tragic illness that none of us understand and few of us tolerate – – but it’s not shameful. Despite many trials with different chemical cocktails, none were able to really help my brother-in-law. Typically, one is afraid of what others will think if it’s known that someone in the family is mentally ill, and this segues into the scary possibility that no outsider will want to marry into a family beset by mental illness. The family is also concerned that they will be judged for their care-taking decisions. But each mentally ill person’s situation is unique, as is their family dynamics. Unless you have walked in those shoes, you cannot imagine the difficulties, the pain, and the heartache. Perhaps you could do better – – and I honestly hope you never have to find out. My brother-in-law was a good person, and in his own way, in better times, he made a difference; in worser times he wasn’t a complainer or angry at his fate of years of illness. He was happy with nothing – – and I mean literally nothing, and I guess that is a middah (character trait) that we can all learn from, zichro l’bracha (may his memory be a blessing). HaShem’s chesed (kindness) was that he didn’t suffer, and wasn’t sick for long, because who knows how he could have dealt with it alone in L.A. and with his confused mind. It was also a chesed that of the brothers, he died first, so that my husband and his other brother could take care of things and see that he was buried properly and in a kavodik (respectful) and expeditious manner. Hopefully my in-laws and his grandmother, who predeceased him, are now able to have the full nachas from him in shamayim (Heaven) that they were sometimes denied on earth. Written in memory of David ben Yisrael, may he rest in peace. 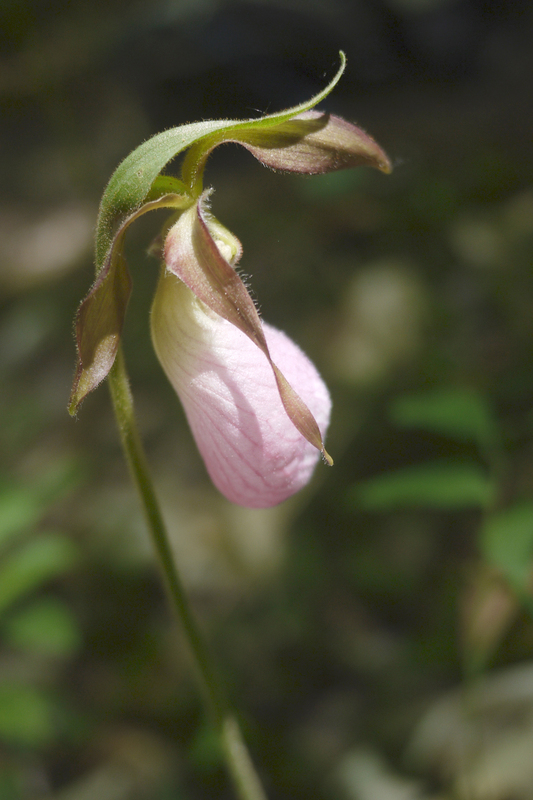 A pink lady’s slipper along the trail. These wild orchids are protected flowers in Maine. In the midst of a heat wave of 90 degrees (but thankfully, not humid! ), we decided to go on an easy 2-part hike, knowing that if the heat became too strong we could easily turn around or just do one of the parts. One thing we have learned, is that we are not in a competition. Hiking for us is more about fun than physical prowess or putting ourselves under pressure to be superjocks. 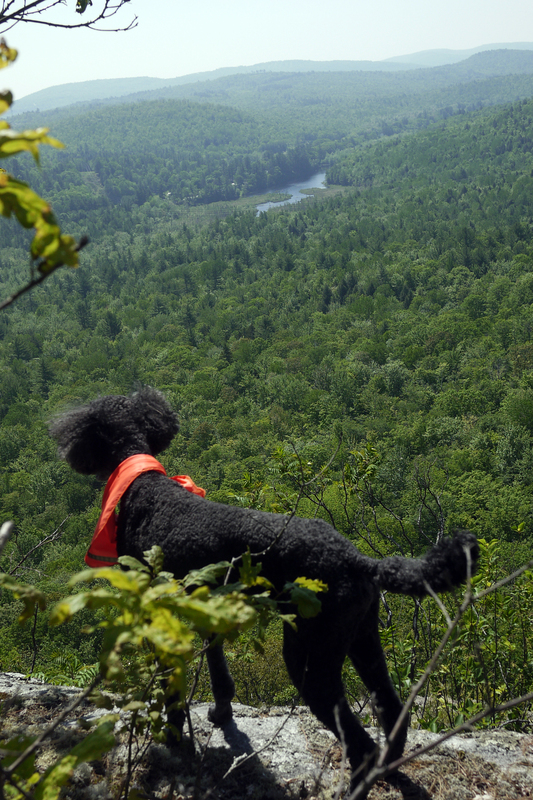 We decided to hike Bucks Ledge and Lapham Ledge, a hike so easy a two-year-old could do it. 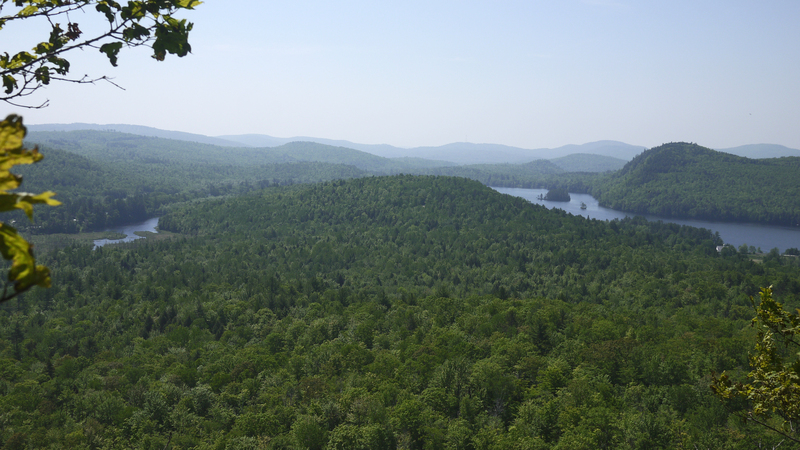 These two ledges offer magnificent views of western Maine mountains, rivers and lakes. Almost immediately, however, we knew we were in trouble. Much of the hike offered little protection from the unrelenting sun. There were also plenty of mosquitoes who made mockery of our bug repellant. The good news is that when we made it to the top of Lapham Ledge, there was a nice breeze. It was still plenty hot, but the breeze made it tolerable and the bugs were at a minimum since they prefer still air. The views of Bryant Pond were lovely, too. That said, it was hard to gather the momentum needed to continue further up the trail to Buck’s Ledge, so we decided to quit while we were ahead. Upon our return we awaited the predicted severe afternoon thunderstorm, and severe it was! It only lasted 15 minutes, but the trees were nearly bent double by the force of the wind and torrential rain that followed. In fifteen minutes, the temperature dropped 15 degrees, from 90 degrees down to 75! Thankfully it meant that it would be nice and cool by bedtime. Fortunately, thanks to the super-insulation of our house, really hot days have been manageable, which is fortunate considering we don’t have air conditioning. Usually there is a 15- to 20- degree difference between interior and exterior temperatures. Twice since our move to Maine the temperatures have hit over 100 degrees, but our house was never hotter than 85 degrees. The biggest difference is that days with high humidity are rare, and heat waves only last 2 or 3 days at most, unlike my hometown where a heat wave lasts the entire summer amidst humidity that makes everyone’s minds go to mush. Not that I hadn’t tried! The second time, in early winter, it was not really our goal to make it to the top, but simply to walk until snow or ice would prevent us from continuing further (this was before we owned crampons). We made it to the granite boulders and ledges, but the ice was not safely navigable in our hiking boots so we called it a day. Well, the third time was the charm. My goal had been to build up to the challenge by taking smaller hikes until I was in prime condition, and then wait until September when the weather cooled and the bugs were gone to make the ascent. Although my stamina level is reasonably good, I’ve been having problems with sore feet for the past few years. First it was plantar fasciitis. Then my heel suffered a stress fracture and I had to wear a “boot” for several months until it healed. Lately I’ve been suffering from Morton’s neuroma, where due to an inflamed nerve, after 2 miles my toes would go numb and by 3 miles they’d hurt so badly I was practically hobbling. I was convinced that if I could only find a hiking boot with a roomy enough toebox that wouldn’t squeeze my toes as they swelled, I would be able to walk without pain. Living in hiker’s paradise in a rural area means that despite the absence of a Costco or Target, there are stores that cater to outdoor sports, and I spent the next 3 weeks trying on hiking boots. There is a whole new class of hiking boots out there, which look like glorified, ankle-high sneakers. Most people love them because unlike typically stiff hiking boots, they are super light and supple, and can be worn straight out of the box without the usual break-in time. These would have been my first choice if my feet were 20 years younger, but I found I required more upper ankle support on uneven surfaces than these could provide. But unfortunately for me, most traditional hiking boots were also rejected outright, due to a narrow toebox. Or, if the toebox was big enough, the rest of the boot also fit big and my narrow heel would slip out (a sure precursor for blisters). Still, a few possibilities gave me hope. But no sooner would I bring the boots home and wear them around inside for a day, that I’d realize that they wouldn’t work, and I’d have to return them. For another 2 weeks I ordered several pair of boots online at Amazon and Sierra Trading Post (the latter is my favorite outdoor store), but these, too, were sent back. The thought of never being able to hike any distance beyond 2 miles without pain made me downright weepy, but I was not about to give up. Out of sheer desperation, I visited Limmer Boot Company. There are two divisions: custom and stock. The stock boots typically retail for around $400; the custom boots are $650 and are created from a mold of your foot. Peter Limmer is a third-generation Limmer cobbler, and all-around cool guy. While clearly Limmer boots are more than I need in terms of price and construction (he supplies hikers who climb Mt. Everest! ), the boots did fit my feet and clearly, with the heavy soles and one-piece thick leather upper, they would outlast my lifespan (until 120). In between cementing, sewing, cutting, and resoling several pairs of boots, Peter took one cursory look at my feet and said, “You need a wide toebox. I have only one stock model that will work for you, or else you’ll have to order custom.” By telling him about my foot woes (he’s heard it all over the years), he was able to make suggestions that no podiatrist had even thought of. Actually, as I later learned, Limmer Boot is famous for its quality craftsmanship and personal attention, and hikers literally make pilgrimages from around the world to visit his old-world store, located only 35 minutes from my home! But at that price, it had to be a last resort. As I stopped by Eastern Mountain Sports on the way home, returning yet another boot that didn’t work out, I spied one I hadn’t noticed before and asked to try it on. It seemed like it might work, so I took it home to try out for a day before committing. 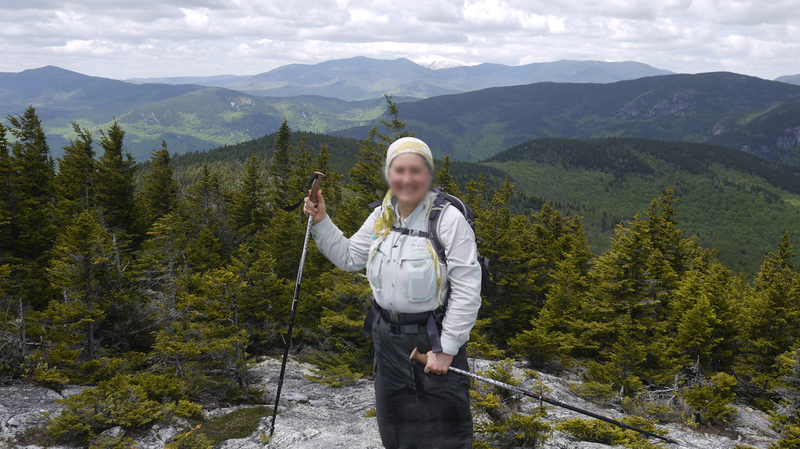 Indeed, this hiking boot was quite comfortable, and it was hundreds of dollars less than the Limmers (though there was no comparison when it came to quality – – with the Limmers, you really did get what you paid for). It was good enough for me and my jaunts, however. I did a short walk of 3 miles pain-free, and felt super motivated to tackle some more serious hikes. I thought I’d do an old favorite of mine, Lonesome Lake in Franconia Notch in NH, on Memorial Day weekend. It’s not a long hike, but it is quite steep and with gorgeous views. The trailhead is about 1 hour 45 minutes drive from my home. But on Memorial Day I was feeling especially peppy, the weather was clear, the skies were blue, the sun was shining, and best of all, there was a breeze, which meant bugs would be at a minimum. I couldn’t wait to get out there and the long drive to Franconia Notch meant hours driving that I could instead be hiking. We decided to go for . . . Speckled Mountain! 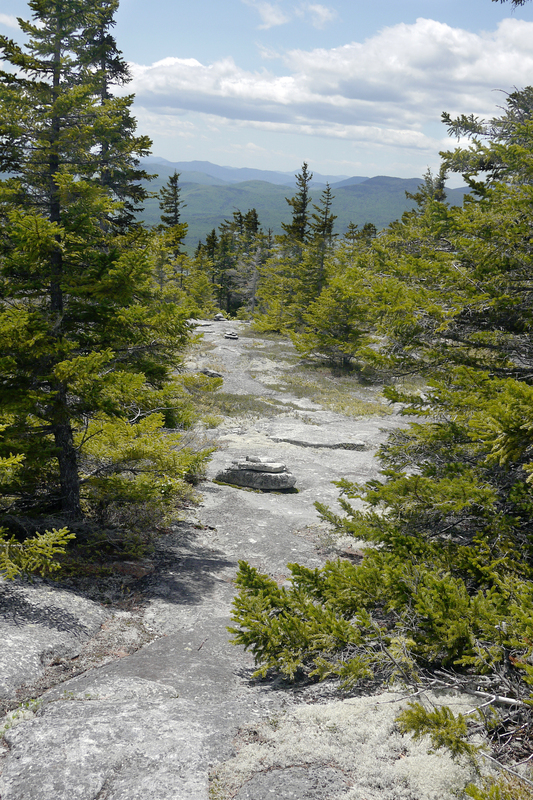 There are three possible routes to the top of Speckled Mountain: via Evans Notch off Rte. 113, which is the most popular route; via the Red Rock Trail; and the Cold Brook trail. We followed the Evergreen Link Trail, which connects to the Cold Brook Trail, for several reasons: it is the closest to our home (we can actually walk to the trailhead), it offers amazing views on the way up from granite ledges, so even if my feet didn’t make it to the top, there would still be much to see; and it is the least traveled trail, which means we’d probably not run into anyone until we reached the summit. The Evergreen Link Trail starts out very steep, but I was psyched. The minutes and miles (3.4 total to the top) flew by. The beginning placed us under the forest canopy, which was pleasantly cool. 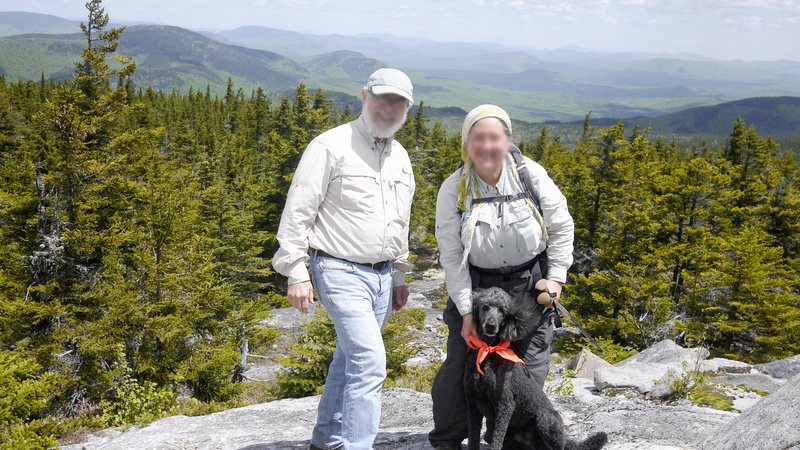 As we reached the first set of granite ledges, the views of Evergreen Valley, Kezar Lake and Horseshoe Pond were magnificent. Other than taking a few snapshots, we didn’t linger, and continued our climb up, up, to the top. About 2/3 the way up Speckled Mountain. This view looks out onto Kezar Lake. Looking down from the second group of granite ledges to the first set of granite ledges, about 2/3 of the way up to the top. Soon we made it to the top. There were 3 other people at the summit. One gentleman had been on our trail, and asked if we saw the moose at the lake. Darn! We must have missed him by no more than 5 minutes. The summit was absolutely amazing. The wind was blowing so hard at times that I had to steady myself to maintain my balance. 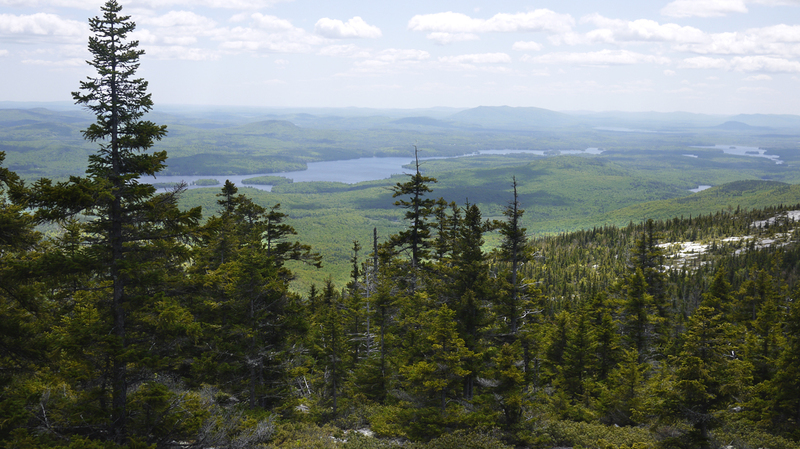 The views were 360 degrees of Maine and New Hampshire. Two days before Memorial Day there had been some surprise weather, and in the distance, Mt. Washington was covered in snow. After relaxing for an hour on the summit (where my husband, much to his delight, was able to make direct radio contact on his ham radio with other amateur radio operators in New Hampshire), and with storm clouds gathering in the distance, we decided to head back. 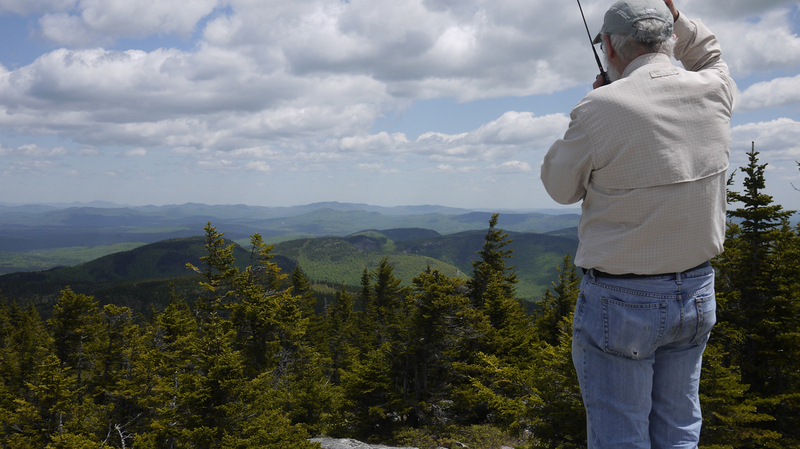 My husband hangs on to his hat under extremely windy conditions while making a connection on his ham radio at the top of Speckled Mountain. 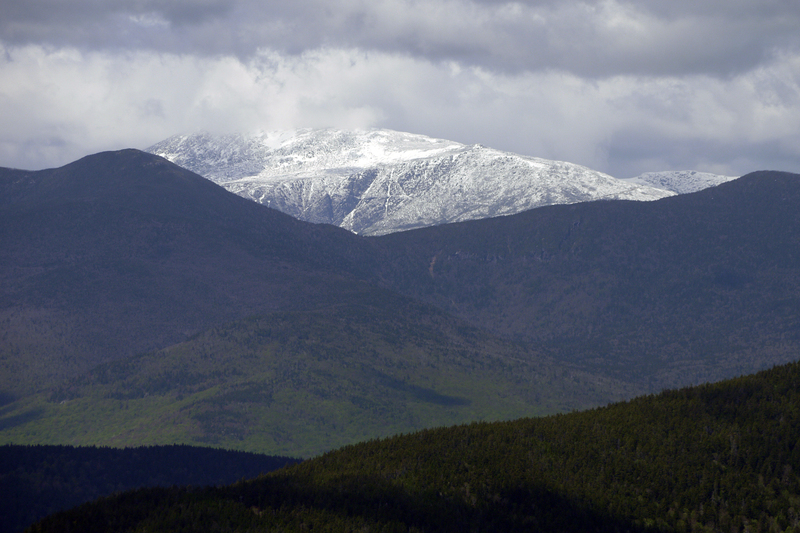 From my telephoto lens, Mt. Washington as seen from the top of Speckled Mountain. There was a snowstorm there two days before. At the summit!!! 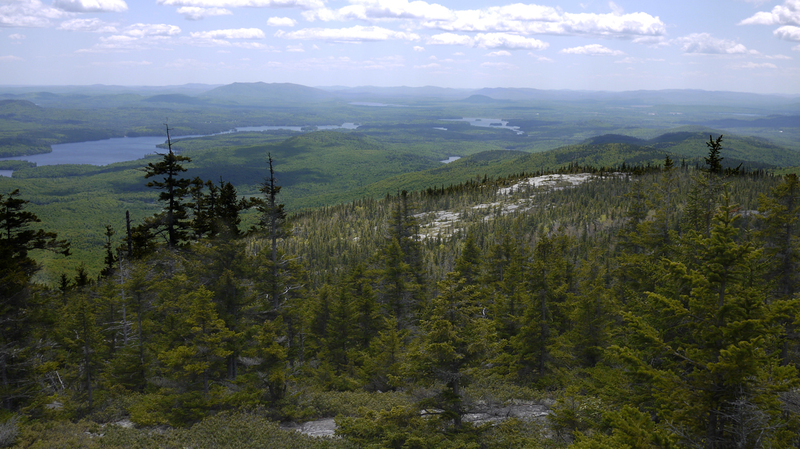 Looking out onto the New Hampshire side from Speckled Mountain. Mt. Washington is covered in snow in the background. That’s when I felt my age. My ankles and knees felt every painful downhill step. My muscles were weak, and I had “Howdy Doody legs.” (If you are too young to know who Howdy Doody is, just imagine a marionette puppet’s jerky legs going every which way and you will get the picture.) Miraculously, neither my hiking boots nor my feet hurt, baruch HaShem! We made it down the mountain feeling somewhat old and tired but without incident; both my husband and I were on a “high” from our accomplishment of 6.8 miles roundtrip, as well as from the stupendous beauty of HaShem’s world with which we were rewarded for our efforts. After a hot bath and cold beer (not in that order) we were revived and planning our next hike, weather- and bug-permitting.